Or eating…to be more precise. We arrived in Kyoto in the afternoon and there wasn’t enough time to go to any of the temples then; cutoff for visitors is usually 4 or 5pm. So after dropping our bags off the hotel we set off straight to Nishiki Market. 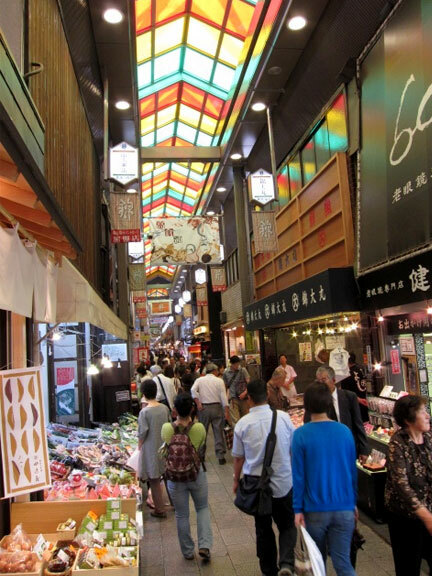 A 400 year old food street in the heart of Kyoto stretching about six blocks. 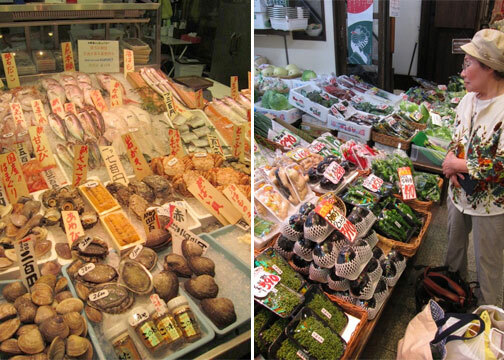 It’s quite a narrow lane, and not Japan’s biggest market by far, but the selection of food and food related products is quite impressive. Quality was also unreal. I’ve never seen such pristine produce. 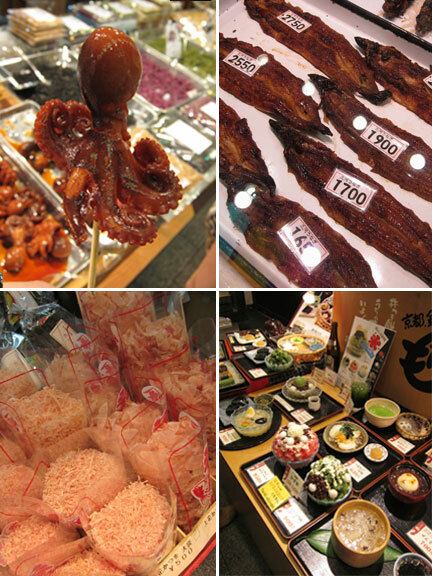 Top left clockwise: The most tender, glazed baby octopus. A whole quail egg is stuffed into the heads. Unagi of different qualities. Japanese ices in plastic preview form. Bonito shavings; the basis for most Japanese broths and popular takoyaki topping. 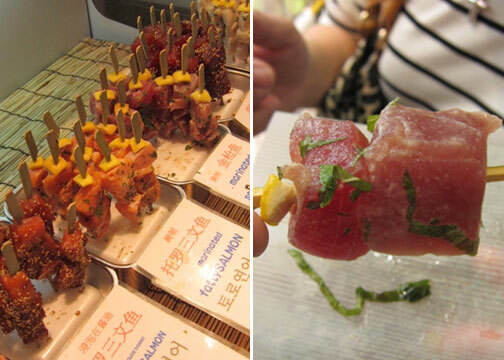 Sashimi on skewers. Really fresh stuff, all that’s needed is a squeeze of lemon. Japan loves it’s soybeans. 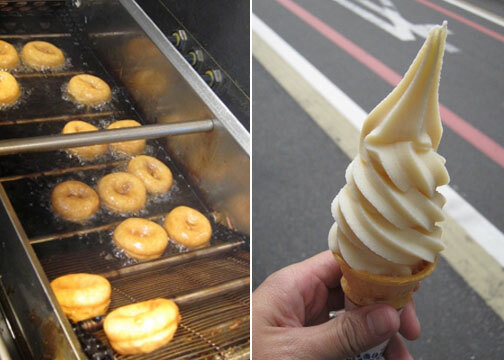 And here you’ll find a lot of soybean products including tofu doughnuts and soy milk soft serve ice cream. Towards the end section of Nishiki you’ll find Aritsugu. Famous for its exquisite knives. Chefs and enthusiasts from all over the world pay a visit to this place to splurge on some hand-forged carbon steel knives. And I can understand why. They’re beautiful. 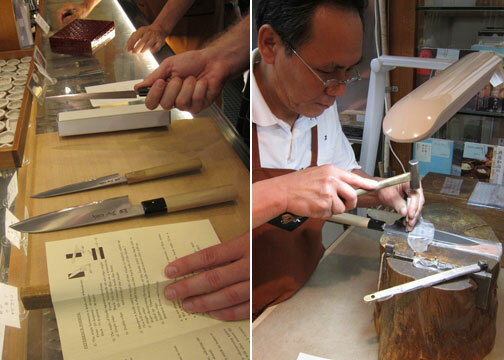 You can even have your name engraved (in Japanese characters) when you purchase one. Beyond the food section you’ll find a maze of different retail establishments. Lots of independent coffee shops, thrift stores and local brand clothes. A temple, even. And so after an interesting afternoon of grazing and window shopping we headed off to have dinner at Anzukko. When I read about Anzukko being Kyoto’s tastiest gyoza, I just had to give it a go. A literal hole in the wall with a service bar and a few tables that roughly fits a dozen people. 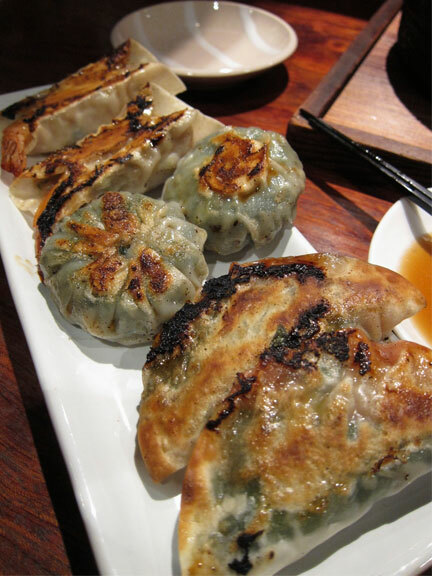 They cook their dumplings, a dozen per serving, in a special cast iron vessel. 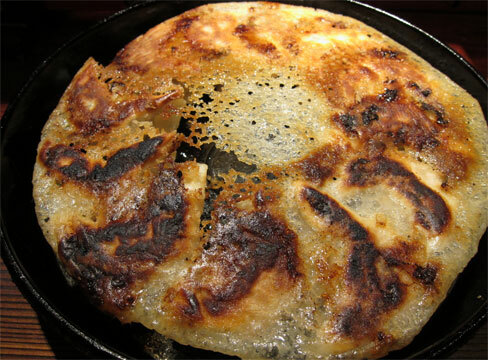 A lace cookie-like crust of meat juices and wheat forms at the bottom and the whole thing is then flipped before serving; pot stickers bottoms-up. And it’s a thing of beauty. You get brittle, salty crunch from the crust and the filling is just so succulent. And uniquely spiced. I don’t say this much (or at all) but its the best gyoza I’ve ever had. We had gotten the set for two people which includes a lot of food as stir fried soba and steamed shrimp dumplings. But what I really loved was their ume-shisho gyoza. Similar meat filling but with perilla leaves and pickled plums mixed in. The sweet aromas from these just worked great with the pork. After dinner we walked towards the river and stumbled upon a quaint patisserie with these incredible looking tarts. I had a tomato tart and the wife had the strawberry. Delicious. 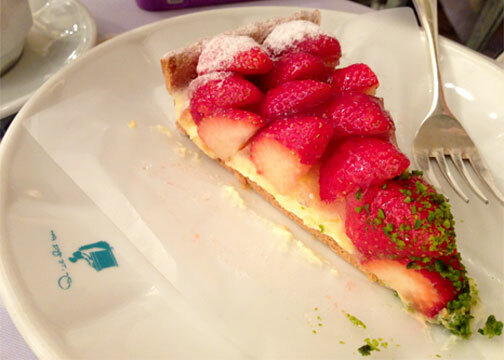 The creme patissiere underneath the fresh fruit was delicate, mildly sweetened and didn’t overpower the toppings. The name of the place was Qu’il Fait Bon, and later found out it was a very popular Japanese chain originating from Tokyo. We had seen people lining up for hours in Osaka just to get a seat in one of their branches and quite thankful we didn’t have to go through that. So glad to have had a great food introduction to Kyoto. Stick around for more food adventures in Kyoto-Osaka soon. I just have to sort through about 500+ pictures! AP, Can't wait for more!